More tips on drawing Naruto anime. 1. Get a picture of your favorite Naruto pose. If you don't have any, I highly recommend you to buy a Naruto comic because it is the cheapest way to learn. If you find it too small for you to learn how to draw, than I recommend you to get Naruto wallpaper. 2. Search for a one page face of Naruto. Here, I've selected a Naruto face from a Naruto comic, Volume 26. 4. 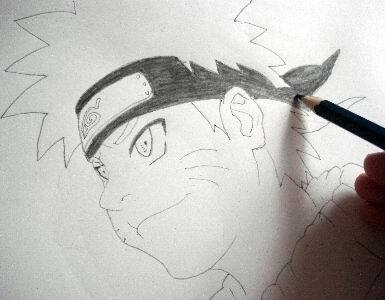 Start sketching Naruto's eyes using a HB or 2B (I prefer 2B) pencil. Actually based on your Naruto's picture, you can literally start your drawing pencil sketches from any part. You can start draw Naruto from his mouth, or nose, or his head. But I prefer to start drawing from his eyes followed by Naruto's eyebrows, then his nose and then his mouth. 7. 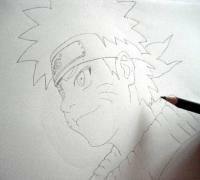 After that, use your 4B grade graphite pencil to darken your line drawing as well as toning Naruto's eyes and eyebrows. 9. Finally, your hand drawn Naruto picture is ready. Show it to your friends or family members to get some comment on your Naruto drawing. I highly recommend you to digitize it using a digital camera or a scanner. Then upload your Naruto drawings at Your Drawing Space where you can share it to not only your friends and family members but to the world! 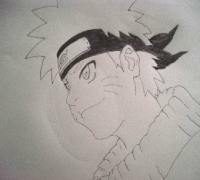 Get the idea on how to draw Naruto in pencil? You can create your own pencil sketch face of Naruto at any angle that you like. Or, you can have your own personalized t-shirts from this Naruto drawing. Visit Custom T-Shirts to have yours... There is no minimum order required. Perhaps you might want to learn easy steps on how to draw Manga like a professional Manga artist, then follow this link: How beginners learn to draw Manga quickly and easily?